Repsol Honda's Dani Pedrosa underwent surgery on Tuesday morning at Barcelona. MotoGP surgeon Dr. Xavier Mir carried out the surgery successfully in the Universitario Quirón Dexeus hospital. The rider was diagnosed with compartment syndrome, commonly known as 'arm pump', after the racing weekend at Jerez. Doctors claim that Pedrosa will recover in time for the next round in Le Mans, scheduled for the 18th of May. 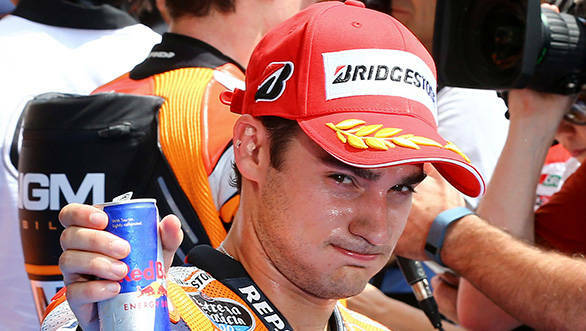 Pedrosa trails teammate Marc Marquez by 28 points and sits second in the driver's standings. The Spaniard will be hospitalised for 24 hours, with his arm rendered inactive for the period. Compartment syndrome is not a common occurrence among motorcycle racers although lately, a number of MotoGP riders, which include LCR Honda's Stefan Bradl, have been affected by the syndrome. The condition occurs when there is insufficient blood supply to muscles and nerves due to increased pressure within one of the body's compartments, such as an arm, leg or other enclosed space within the body. Repsol Honda's statement on the issue says, "After an intense weekend of action at the Spanish Grand Prix, where Dani missed out on second place by just 0.098s, followed by a positive day of testing on Monday, Dani received surgery this morning to treat compartmental syndrome, in order to fix an ailment common amongst World Championship riders." Pedrosa hasn't found top form yet this season, failing to topple fellow Spaniard Marquez. Having won his last race back in October the previous year, Dani will be looking to recover as soon as possible.